That said, the film still has most of the same problems. If you didn't like this version of Lex, got upset at Batman killing, wished Superman would crack a smile or we're incredulous at the whole 'Martha' moment this version of the movie won't do anything to change your overall opinion. I've seen the theatrical cut twice, a week or two after release, and this new version once so it's a little hard for me to remember what I did or didn't see in the theatrical cut. Two things did stand out to me. In the theatrical cut, there's a moment with Bruce Wayne attending an illegal fist fight where Bruce helps up the losing fighter, gives him a quick tip that turns the fight around. The fighter nods his appreciation to Bruce for the advice. I swear the advice part has been cut from the Ultimate edition but the fighter giving Bruce a nod for the tip has been left in. It's odd because Bruce and the fighter have this brief moment of acknowledgement that seems like they both know something that the audience hasn't seen. Maybe I missed it but I'm sure it's been cut out because the exchange between them now seems a little odd? Why they cut it I have no idea? It makes no difference to the plot, it's just a moment that shows Bruce knows how to size up an opponent and see their weakness. Personally, I'm going to believe that the Jimmy Olsen we see in the film is Jimmy Olsen senior who has a younger son called Jimmy, who is following in the old man's footsteps as news photographer. In a future Superman film we'll see the young Jimmy Olsen be teamed up with Lois Lane - maybe he'll seek her out since she was there when his dad died? Then we could have the proper version of the character rather than some expendable CIA agent (I just don't buy Jimmy Olsen as a CIA agent in any version of these characters). Overall if you liked the theatrical cut, you'll like the Ultimate Edition even more because it does improve the film without really changing anything that you've already seen. Mostly it helps you understand just a tiny bit more about Bruce and Clark's respective viewpoints in the build up to their anti-climatic fight. Unfortunately they don't cut out the whole 'Why did you say that name?' moment and give Batman a real reason to do a complete 180 degree turn on his motivation. Seriously, the world's greatest detective didn't do any background research on Superman's life on Earth? Lois Lane tracked him down to his Earth family before anyone even knew him as Superman... and she even leaked her initial story to a blogger. I digress... overall I still like this film for its parts more than the whole. I hope WB and Zack Snyder have learned from all the feedback where they're missing it with audiences and, perhaps, get back on track with the upcoming Justice League movie. 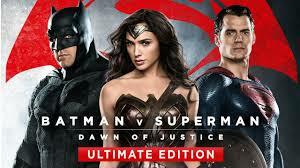 Batman v Superman is a solid introduction for Batman and Wonder Woman into this new DC universe. What's needed is someone else to take the reins on Superman because Zack is making him almost joyless... which is more of a Batman thing. For me the movie has done it's job. I"m excited to see Wonder Woman's upcoming solo movie. I'm interested to see how the Justice League pans out and, if I could get one good Batman solo movie with Ben's Batman (with a bit less henchman death) I'd be pretty happy. Oh... and Suicide Squad... I'm really looking forward to Suicide Squad in August.